Who said that Fashion and Trendy has to be expensive? 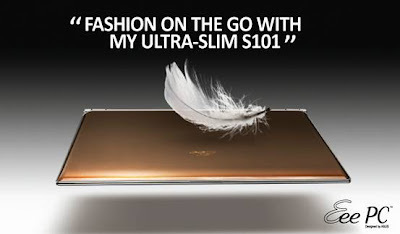 ASUS had just launched the Eee PC S101, a well designed netbook for fashionable individuals who put fashion and style as an important factor for buying a laptop. The Eee PC S101 builds upon the industry-pioneering form factor, ergonomics and features of its predecessors but boasts a beautiful exterior in three gorgeous colors—Brown, Champagne or Graphite. Its incredible portability weighing a mere 1 kg and svelter than most fashion magazines at just 1.8 cm enables users to carry themselves with effortless. At times, you would had mistaken if for a Apple's MacAir. 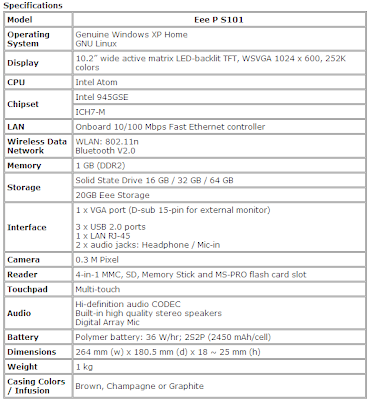 For details of the spec, pls check out below. well i dont know whats good in this laptop? well what this has to do with fashion?